Alabama currently has the No. 1 recruiting class in the nation, technically has four committed players heading into National Signing Day. But the Crimson Tide is still pursuing several other high-level prospects. 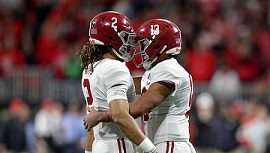 With additional signings, 247Sports’ Director of Scouting, Barton Simmons, believes Alabama’s 2019 class could be one of the best all-time. He's rumored to flip to Florida, but who knows! I'm going to try to pick up the coverage on Sirius radio, but if you could, shoot me a text on some of these in case I can't find it. I'll be at the gym until about 9:30am, but will send them as I learn them. Bogle puts on the Florida hat and does the gator chomp. DL Byron Young, 77th overall player, stuck with Bama. Christian Williams flipped to Miami. Even though he's been committed to Bama since April, he's long since been considered gone. Bama went after some other DBs who came in during the early signing period, and I don't think the staff considered this a loss. Word is that LSU also turned him away recently. I realize it doesn't matter about class ranking until 4 years later but...going into today Bama had the #1 ranked recruiting class. Is it possible that they could be knocked out of the #1 class? Jerrion Ealy (#3 RB) goes to Ole Miss. Wants to play baseball too. He'd de-committed from them earlier. Most everyone thought Clemson had him. Possible now that UGA got Pickens. But not likely. DT Nathan Pickering stays with Miss State and signs with them. DL Byron Young to Bama (signed??). DE Charles Moore, who'd visited 3 different schools in the past week, signed with Boogs. Bama gets speedy Eric Poellnitz, a KR and WR. He will get a PWO for the summer, then a scholly in the fall. LOI FOR BYRON YOUNG IS IN. 4-star CB Kaiir Elam from Florida expected to choose between Florida and Georgia. still trail Bama by 314.70 to 308.28.